This module aims at building understanding on robust decision making to deal with uncertainty. It also includes approaches and different methods that could be used for adaptation screening. It has been developed under the C3D+ project and weLEARN. It has been included in several trainings, working with partners in South Africa (2010), and Senegal (2012). The idea is to develop this module further to include more methods or approaches for adaptation decision-making. 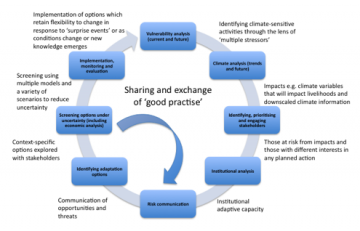 Adaptation planning can be informed by various tools and methods. The specification of the adaptation problem and the available inputs, views and preferences from different actors in the decision process inform the choice of methods, tools and approaches. 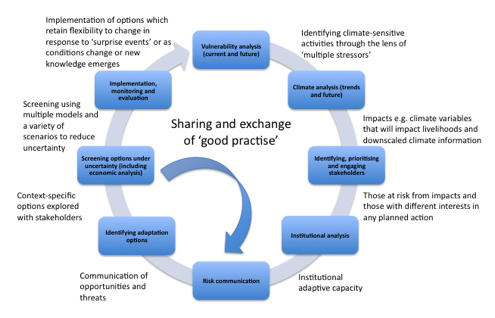 Tools and methods will also vary according to the stage in the decision-making or adaptation planning cycle as shown in the figure below. An important principle is that there is no one method/approach/tool that suits all circumstances of the adaptation decision-making. Hence, it is important to look at their conditions of applicability. This principle is at the core of this adaptation planning module.